Bloomberg reports that Nintendo investors are beginning to pressure the console and handheld gaming giant to start offering their iconic titles, such as Super Mario, Donkey Kong, Metroid, Zelda, etc. on Apple's iPhone, iPod touch, and iPad platform. On July 6, Nintendo shares jumped the most in almost four months after Pokemon Co., a former unit, said it’s developing a game for the iPhone and handsets running on Mountain View, California-based Google Inc.’s Android software. JPMorgan Chase & Co. (JPM) sent a note to clients saying the move indicated Nintendo may begin making titles for products outside its proprietary hardware. Hours later, Nintendo denied any change in strategy, and the shares surrendered gains. Instead, Nintendo is cutting the price of their thus far disappointed 3DS handheld, and betting on their new Wii U console. Sega and Atari, who exited the console space years ago, offer a variety of titles on iOS, while Playstation maker Sony has brought PSP-like services to Android devices and Microsoft is building XBox Live into Windows Phone. 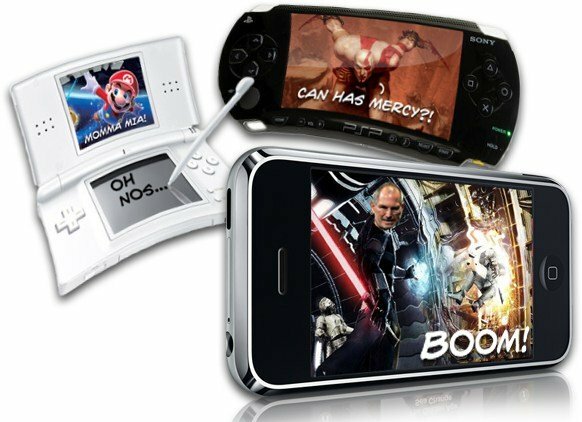 Nintendo could likewise try to create their own smartphone or tablet, partner with an existing company (RIM BlackBerry or HP webOS?) or simply start offering titles for existing platforms, like iPhone, iPad, and iPod touch. But it doesn't sound like current management has any plans to do that, any time soon.